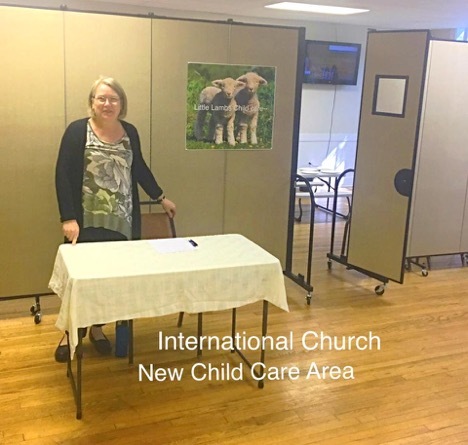 Offering a dedicated Sunday school class for young children continues to be a need in smaller to churches as it is with The International Church Norwich. The staff decided to offer Little Lambs Child Care during Sunday morning services. This required some creativity and planning on the staffs part. After locating the appropriate space for the daycare in the church basement, the staff was concerned about safety with the stairs being located in the only available room. Our expert sales team recommended adding our optional swing-style door to the end of one Screenflex room divider to fully enclose the new Sunday daycare room. The divider also splits the room into two sections one side for learning and one side for play. Watch the video below to see how excited the new 8 little Lambs enjoyed their new space on their very first day. What a wonderful beginning!